Aspen found this out firsthand in July 2008. 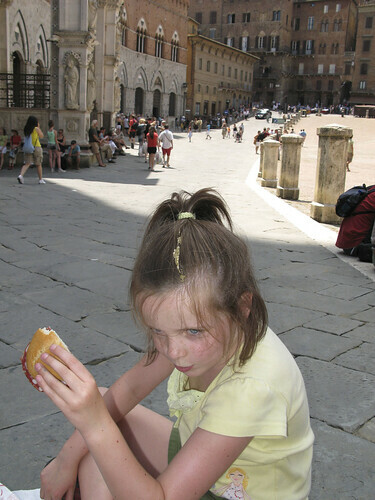 While enjoying a picnic lunch in the Piazza del Campo, her head became a bird’s bulls-eye. As she reached up with her napkin to wipe the bird poop out of her hair, I yelled for her to stop. Why? To be honest, so that I could document this Kodak moment. And, so that I could share the wisdom I had gleaned from one of the many travel books and websites I had read in preparation for our trip. When dealing with bird poop in one’s hair, fight the instinct to immediately wipe it off, which would only result in smearing it everywhere. Wait until it’s dry and then simply flake it off. Trust me. It works. Enough about bird poop. 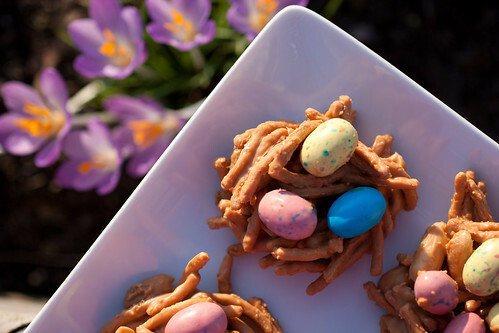 Back to bird’s nests, as in edible Bird’s Nests to celebrate spring. They’re fun. They’re easy. They’re good. And they’re perfect for little hands to help with. Line baking sheets with wax paper or a Silpat. Melt butterscotch chips and peanut butter together over medium heat. 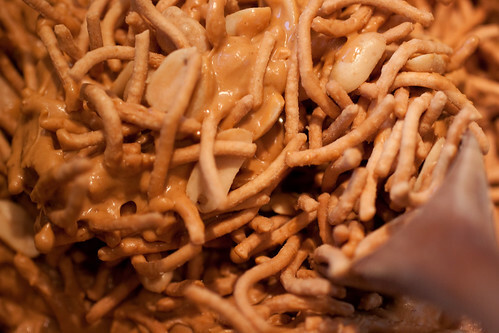 Gently stir in salt, chow mein noodles, and peanuts. Mix well. Spoon onto prepared baking sheets. 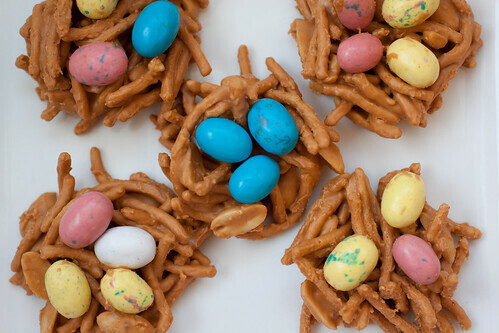 Shape into birds’ nests and add a few eggs to each nest. Let stand until firm – can refrigerate to speed this up. Store in airtight container. 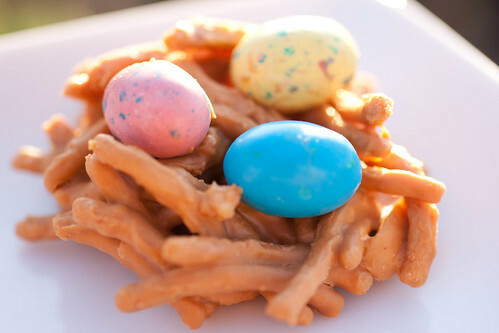 8 Responses to "Birds’ Nests Cookies"
These look great! I’m planning on making them. Thanks for sharing this recipe. Also, any chance the peanut butter prototype cookies you made for the b-ball team party might make the website? We are still talking about how delicious they were! These are so fun! I’m definitely planning to make these for next weekend…thanks for the idea! Hi Katy – After talking with you at church today, I came home and tinkered some more with my peanut butter cookies – with good results! Hopefully I’ll be able to post them for you soon. Hi Candi – Yes, I do remember the seagull’s white poop in Aunt Thelma’s red hair. Too funny! Alas, I don’t have a picture of that to share. Happy 1st Easter to your precious twins! Hi Lana – If you substitute chocolate chips the nests will just turn out darker and be a true “chocolate brown”. Go for it! Hi Lana – Glad you like ‘em! By the way, your frosted sugar cookies for Easter are so cute.